Successfully Added External Speakers for iPad to your Shopping Cart. 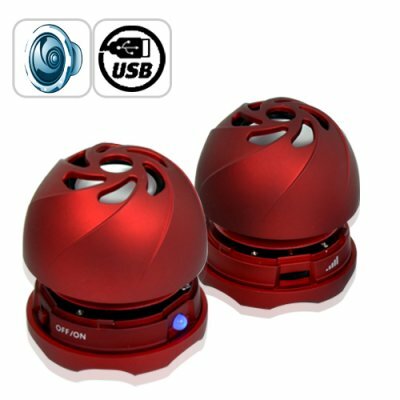 The Chinavasion CVPE-G213 Red Mini Speaker set is your perfect partner for great music output. Shaped like mini sized crimson red hamburger style speakers, they're being called the first "must have" accessory for your iPad. These external speakers are actually made of two mini hamburger speakers that are built with cutting-edge technology and produces dynamic and vibrant sound that will truly amaze everyone. They can be attached to each other thanks to their magnetic base. Both mini speakers have bass reverberation chambers that can be extended upwards by giving it a side way twist, and hence produce a better base response. These mini speakers are compact enough to fit in the palm of your hand, but still powerful enough to fill the room with big sound and full bass. They are great for sharing your tunes while relaxing outside, vacationing at the beach, driving in the car, hanging out with friends at school or at the mall, or even relaxing at home and in the office. The combination of power and portability makes these external speakers for iPad, the ideal complement to not only iPad, but also other small gadgets like your cellphone, iPhone, iPod, PSP, NDS, MP4 player, laptop or notebook computer, CD player, PDA, computer and many more gadgets that use a 3.5mm audio jack. Looking for a tasty item for resale? Hurry-up and place your order right now before our first production run sells out! Since these are the first ultra-portable external speakers for the iPad they are sure to be hot sellers for your webshop. You simply cannot go wrong with our low wholesale price and 24-hour express shipping service. Only available from the leader in wholesale electronics - Chinavasion. This is not claimed to be an authorized or branded product by Apple Inc., although it is compatible due to universal 3.5mm audio jack. The product and our company are not affiliated with Apple Inc. or endorsed by them in any way. Compact travel speakers with big sounds! Does the speaker always have to be connected to a USB port? No. You have to plug this device into a USB port to charge it. Once it is charged, it can be used without USB port. No, they must be linked together using the mini USB cable for both to work. Once this speaker is fully charged, how long can it play music before it needs to charge again? Depending on the volume of the music you are playing, the battery can play for 4 to 6 hours without recharging. Can I charge and listen to music at the same time? Yes, you can charge the power and listen to music at the same time. How loud is the External Speaker for iPad? The External Speaker for iPad is definitely loud enough to provide sound for an entire small- to medium-sized room. How does this speaker compare to the X-Mini? In terms of value for money, the External Speaker for iPad beats the X-Mini 11 times out of 10. Don't take our word for it, look for "Hamburger Mini Speaker", "Burgerbass Mini Speaker", "Bassburger", and "Mushroom Mini Speaker" on popular forums to read real testimonials from enthusiastic customers. Can I use this speaker for other apple products, such as iPhone, iPod, iNano, iTouch, etc? Yes, certainly. This speaker is perfect for any product with a 3.5 mm audio output.